In the winter of 1947, television history was made, thanks to a blizzard and production mishap. The television schedule was still sparse, consisting of a quiz show, a western movie, three hours of sports, a newsreel, and not much more. The few homes, businesses, and bars with television were lucky to get even 2 hours of programming a night, and the networks were lucky if the 20,000 sets in the city could capture an audience of 50,000. Television was beginning to look more like a pipe dream. If television was to survive, it needed a hit show. Just days after Christmas, Howdy Doody would arrive; and, thanks to a savage blizzard in New England, by mid-day Saturday, December 27, 1947, the entire city and east coast was blanketed with several feet of snow. In New York City, theaters and clubs were closed. Travel was nearly impossible, and many in the city, still bristling with Christmas spirit, had the opportunity to find a set and tune into television. At the NBC studio, problems were mounting as well. The snow storm made it difficult for the cast and crew. Buffalo Bob Smith almost didn’t make it to the 5 pm air time. Howdy Doody, the puppet, didn’t make it the studio at all. In a desperate attempt to put a show on the air, much time was spent on various entertainment for children while building up to the arrival of Howdy Doody. 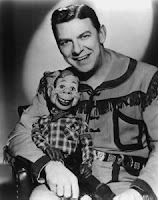 By the show’s end, Buffalo Bob had become the voice of the puppet refusing to come out of the desk drawer. And the puppet never did show that first episode. In many ways, the tension caused by the snowstorm added additional layers and excitement to the show, and certainly increased its audience. By December 28th, Howdy Doody was the talk of the town without even making an appearance. Variety raved and the high viewership continued until 1960. The network’s program schedule ballooned after the premiere of Howdy Doody. The 1948-49 season brought over 120 different television shows to the schedule. For a full account of this story, I recommend the book Please Stand By: A Prehistory of Television by Michael Ritchie. Of special note is Clarabelle the clown is played by Bob Keeshan, the man known to the U.S. kids of the 1960’s, 1970’s, and 1980’s as Captain Kangaroo.